This is a rare treat to see, to say the very least. 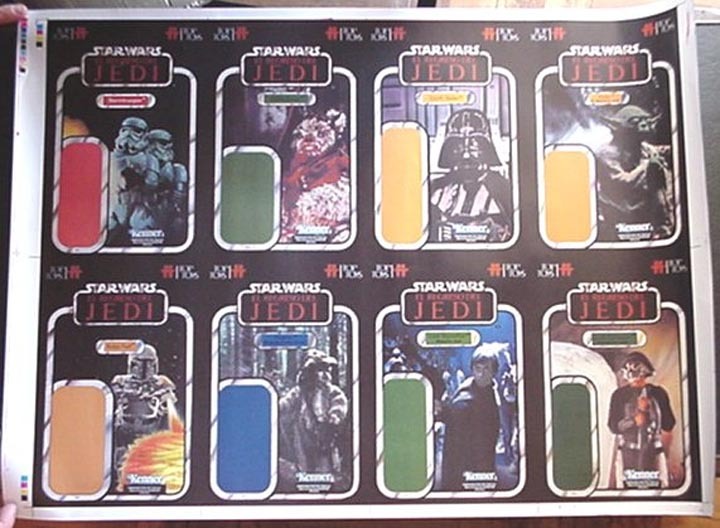 Featured is a proof sheet style presentation board displaying eight proposed characters on Top Toys cards. 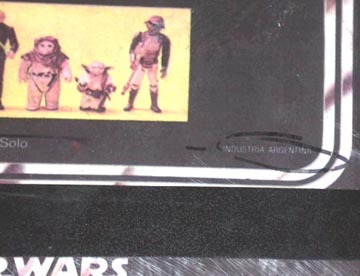 Those familar with the Top Toys line will know that only six characters were ultimately released; the Stormtrooper, Logray, Chief Chirpa, Darth Vader, Yoda and Luke Skywalker (Jedi Knight® Outfit). 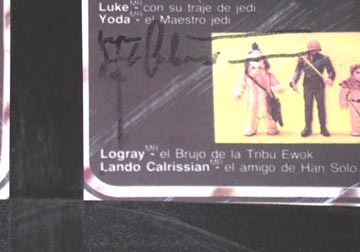 The really interesting part of the board is the fact that it displays two figures - Boba Fett and Lando Calrissian (Skiff Guard Disguise) - that have yet to be seen on production Top Toys cards, or were more than likely unproduced figures. Here is a great close-up that gives you an idea just how thick this board really is. 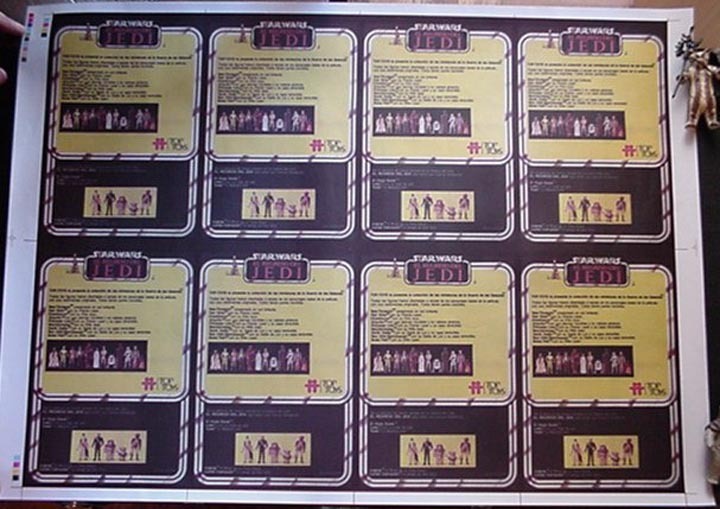 It is a rigid board that measures about 1/8" thick, that appers to be foamcore, with pasted images of the front and backs of the blister cards. It would appear that Top Toys used comp sheets glued to foamcore instead of the more familiar proof sheets that Kenner US would use. 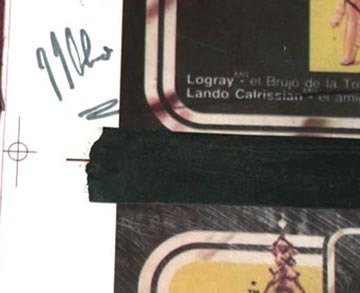 There is one correction on the front - the nameplate for Lando says "Guardian de Jaaba", and there is a bit of pencil next to it that says "JABBA". 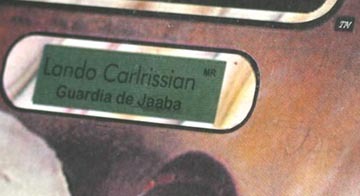 Though it's hard to say whether Top Toys failed to notice or just didn't mark it but Lando's name is also spelled incorrectly as Lando Ca(r)lrissian. It is still unclear as to why the Lando Calrissian and Boba Fett figures were never produced since they made it as far as the proofing stage, and at least Lando made it as far as the painted Hardcopy stage, but have never turned up. 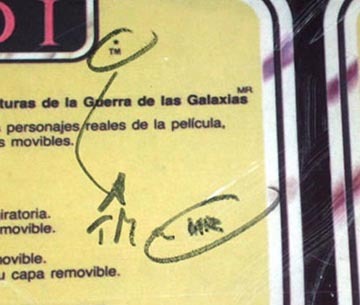 Another interesting fact is that even though neither figure has turned up on a production card the names of both still appear on the back of the production cards. The back of the board shows some scratching and general wear. 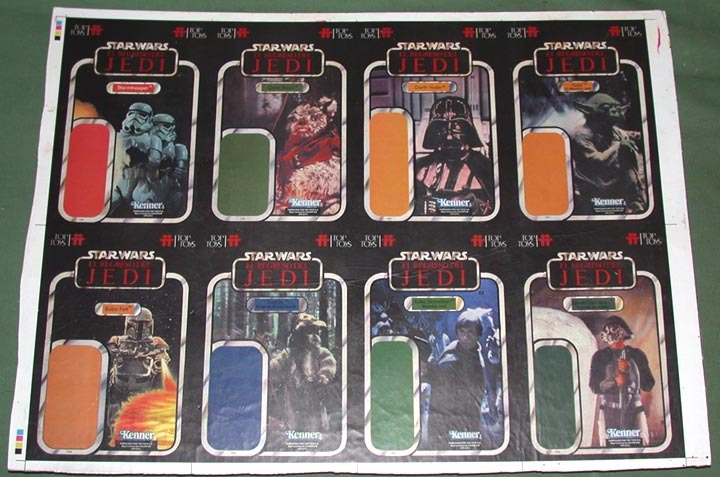 The cardback images are all the same, and they are the standard cardback for Top Toys. There are a number of notes written with black pen, and it has written text along the right side, of which the only word I can read is "OSO". It has black electrical tape running up the center vertically and along the top and middle horizontally. The following images are close-ups of some of the hand-written notes. The final two images are of laser copies of a similar but unmarked proof sheet. As you can see the images offer a cleaner unobstructed look at what these cards would have looked like in the final production stages. 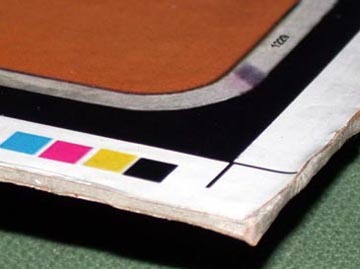 The observant reader will have noted that not only is the sheet unmarked but there are two sets of color bars on the outer left edge, of both the front and back, whereas the presenation board was cut down and only one is left, meaning that these copies were made from an alternate sheet. It's unfortunate that the owner decided to make copies and keep the second sheet for himself because now there are two copied sheets in circulation. The first sheet you can be rest assured is locked safely away in a collection and won't be for sale any time soon but there is a second sheet in circulation so anybody reading this should be cautioned when thinking of purchasing a sheet like this. It would be far too easy for somebody to buy those copies, paste them to foamcore, and "create" a board similar to the one pictured here. Provenance is key in a situation like this so ask lots of questions. Above all else please remember that if it seems too good to be true then it probably is. Foreign to the US prototype material is few and far between but thanks to the diligence of collector Matt Brand this stash of Top Toys prototypes was unearthed. In this stash are a Top Toys Presentation Board, an unproduced Lando Calrissian (Skiff Guard Disguise) Hardcopy , and a Top Toys licensing sheet . Subsequently, Matt's source opted to offer some more prototypes on a popular auction site through two seperate brokers. 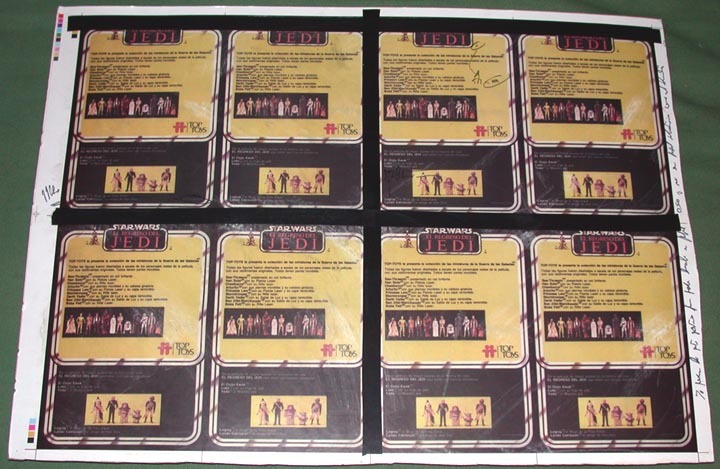 Among these other protypes were carded samples for Luke Skywalker (Jedi Knight® Outfit), Stormtrooper, Chief Chirpa, and Darth Vader, as well as laser copies of an additional unmarked proof or comp sheet.